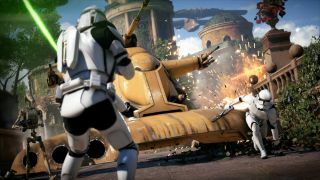 You’ve doubtless noticed all the recent controversy over loot boxes in Star Wars Battlefront 2, and US politician Chris Lee (D) has launched another attack on loot crates and ‘pay-to-win’ games in a YouTube video (following a previous pop at them and Battlefront 2 at the end of last month). The central thrust of Lee’s measures is to ban the sale of video games that contain ‘gambling mechanisms’ to anyone who is under the age of 21. The regulations being proposed here would mean that it would be fine to sell a sword in a game for $200 – an example used in the video. What wouldn’t be OK is to sell a percentage chance to win that sword. The distinction is that if you’re buying something that you know what you’re getting, then it’s a transaction. If you’re buying a chance at potentially getting something, then it’s ‘gambling’, and therefore shouldn’t involve under-21s. The rules would apply across all games and platforms, as Lee sees it, whether sold at retail or by online stores, such as Steam. Lee enters shakier territory (himself admitting this is ‘third-hand’ or anecdotal information) when he further discusses game publishers potentially lowering the odds of getting much-sought-after items of loot in order to effectively milk the player base, as it were. Lee states: “Once the [game] algorithm identifies a player who's likely to keep spending money to buy that one 'unicorn thing' that they're after ... then they lower the odds and then you keep spending more. It's absolutely unethical and unfair." He ends with urging folks who support his cause to write to their elected officials (local and otherwise), providing a template letter of grievances concerning the ills of predatory gaming practices for convenient complaining. Chris Lee keeps the vibe very casual throughout the video – even sitting on a chair backwards at one point (is that really a good example for youngsters in terms of desk and seating ergonomics, huh?) – but the points made here, and the campaign therein, could have serious repercussions for the world of gaming. Unsurprisingly, no matter the initial intentions, when the worlds of politics and gaming collide, people tend to get very nervous about the end outcome, with the usual fears along the lines of sledgehammers-being-used-to-swat-flies. Perhaps this is a space that only needs to be watched for now, but watched carefully.